To merge already finished analyses, click on ''launch analysis'' and choose one of the options under “Merge analyses”. When the analyses to be merged were run from FASTQ input files, VarSome Clinical will perform joint calling on all samples to be merged. The allelic balance and the coverage for each sample will be displayed in the resulting variant table. Clicking on the coverage numbers opens a window showing the read coverage (JBrowse) for the selected variant in that sample. If any of the parent analyses were instead run from VCF input data, then joint calling cannot be performed and so VarSome Clinical and VarSome Pro will merge the results of the original analyses directly. 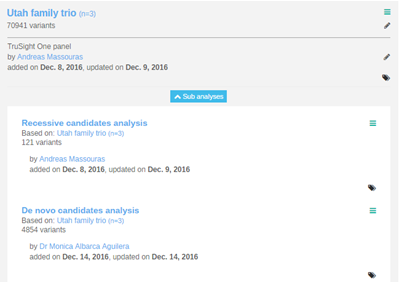 The first entry main sample (Utah family trio), is the merged analysis, and below it are shown any sub-analyses applied to the parent merged analysis (De novo candidates analysis, Recessive candidates analysis). For a trio analysis, the mandatory fields are the analysis identifier, and the identifiers of the Proband, Mother and Father analyses. You can also select any of the listed algorithmic filters which will be applied to the analysis’ results. Please, click on the following icon to get the description of each filter. The algorithmic filters (eg. De novo candidates) are optional, and can be started at any moment. Click on “Start analysis” to launch the analysis. Choose an identifier for the analysis, and an optional description. Then, on the right hand side, select the female and male samples that will be analysed. You can also select any of the listed algorithmic filters which will be applied to the analysis’ results. Please, click on the following icon to get the description of each filter. The algorithmic filters (eg. De novo candidates) are optional, and can be started at any moment. Click on “Start analysis” to launch the analysis. Select this option to merge analyses with no special settings. Simply set an identifier and select the analyses to be merged on the left hand side. Click on “Start analysis” to launch the analysis.